Sefton triathlon launched with prize on offer from Liverpool FC Apr 21 2011 by Mark Johnson, Crosby Herald A GREAT day out with Liverpool Football Club is on offer for the best performing school at the John Hulley Sefton Triathlon. The popular community occasion was officially launched this week and comprises a 2.5km run along Crosby coastline, a 5km bike ride and a swim in Crosby Leisure Centre. It is anticipated that a crowd of more than 4,000 people will turn up to the race on Saturday, June 25, to cheer on pals and family members taking part in the world’s largest community triathlon. This week Jamie Carragher told the Herald: “I am only too happy to support an initiative to get children involved in sport. “The Sefton Triathlon is a great event, especially as it’s in the summer when the kids get the opportunity to swim, ride a bike and run in the same event.” The patron of this year’s triathlon is Lord Alton, who applauded the event’s “rich” culture. The Sefton Triathlon was established in 2002 to mark the Golden Jubilee of the Queen. It was only intended as a single year event, but it proved to be so popular that it was organised again the following year, and has now become an annual event on the Merseyside sporting calendar. Such is its success it attracted 1,500 people to participate in 2010, whose ages ranged from 8 to 88, making it the world’s largest community triathlon. It has raised over £300,000 for numerous charities that support young people. 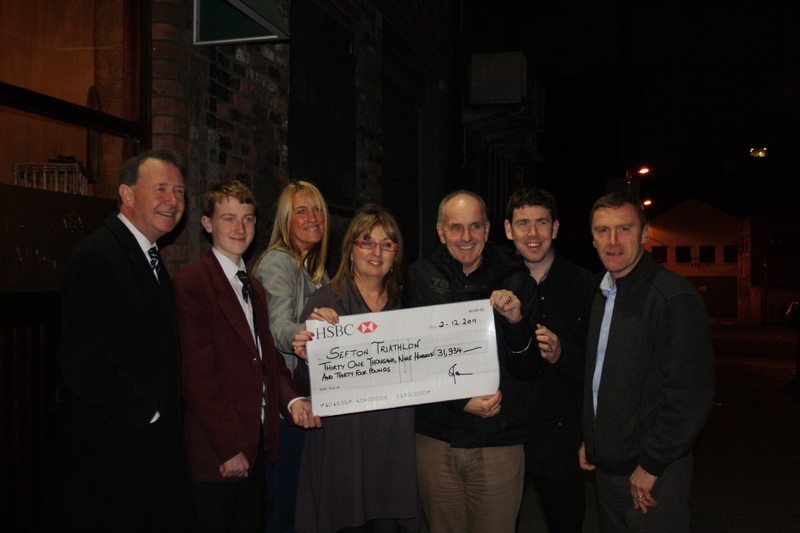 The event received great news recently when New Start Homes agreed to be this year’s sponsors. Lord Alton has agreed to be Patron for 2011 and 2012 when organisers will look to embrace the Olympic Games coming to London by recruiting 2,012 young people in 2012 to take part to mark this once in a lifetime opportunity. Lord Alton works tirelessly through his Foundation for Citizenship promoting active citizenship amongst 800 local schools in Merseyside and the North West and his support will help organisers of the John Hulley Sefton Triathlon achieve its 2,012 target. The Sefton Triathlon changed its name to the John Hulley Sefton Triathlon in 2010 to celebrate the visionary founder of the modern Olympic Games. John Hulley, born and bred in Liverpool, ran Olympic Games for four years from 1862 and created the National Olympic Association at his Liverpool gymnasium thirty years before Cubertin established what has long been regarded as the first modern day Olympic Games. A GREAT day out with Liverpool Football Club is on offer for the best performing school at the John Hulley Sefton Triathlon. The popular community occasion was officially launched this week and comprises a 2.5km run along Crosby coastline, a 5km bike ride and a swim in Crosby Leisure Centre. It is anticipated that a crowd of more than 4,000 people will turn up to the race on Saturday, June 25, to cheer on pals and family members taking part in the world’s largest community triathlon. This week Jamie Carragher told the Herald: “I am only too happy to support an initiative to get children involved in sport. The patron of this year’s triathlon is Lord Alton, who applauded the event’s “rich” culture. The event will see the best performing school land a day at Liverpool FC’s Melwood training ground. Lord Alton added: “We all have a tremendous opportunity to not only get involved in a fantastic community event but also celebrate Liverpool’s rich Olympic history and continue John Hulley’s dream. The sports event is named after John Hulley, who was one of the three founding fathers of the modern Olympic games which is credited to Pierre De Coubertin. He helped start Liverpool Athletics Club in 1861. The first Grand Olympic Festival was held at Mount Vernon Parade Ground, Liverpool, the next year.